Our pool will be closed April 27 and July 8 - 10- 2016 for special events. We apologize for any inconvenience. This hotel is 100pct non-smoking The DoubleTree by Hilton Houston Hobby Airport hotel is situated less than one half mile from William P. Hobby Airport in Houston Texas. The hotel provides easy access to downtown Houston George R. Brown Convention Center Johnson Space Center NASA Reliant Park Minute Maid Field BBVA Compass Bank Stadium and the Port of Houston Ship Channel. Galveston Island a true Texas beauty is a comfortable 45 minute drive from the hotel. Recently renovated the DoubleTree by Hilton Houston Hobby Airport hotel offers 303 Texas sized guestrooms and suites equipped with high-speed internet access a large work desk with task lighting Sweet Dreams by Serta bedding an over-stuffed easy chair and an ottoman. Each room also features the following travelers* essentials in-room coffee makers irons and ironing boards dual-line phones and a top-of-the-line television entertainment system. Great food and service are hallmarks of the DoubleTree by Hilton Houston Hobby Airport hotel Plaza - Boardwalk Restaurants. The breakfast and lunch buffets are popular with Hilton guests as well as local business people. The Boardwalk restaurant offers a perfect respite from a long day on the road and the Sundance lounge provides the relaxing Texas Hill Country feel that goes well with a nightcap or socializing with friends. 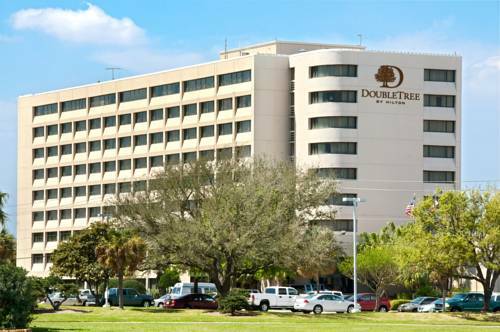 The DoubleTree by Hilton Houston Hobby Airport hotel offers 18000 sq. ft. of flexible meeting and banquet space that can accommodate up to 800 people. Our experienced and knowledgeable Sales and Catering teams are available to make your Texas meetings or social events a success. For a first-class experience in Texas - Take me to the DoubleTree by Hilton Houston Hobby Airport hotel. Credit card guarantee required. See rate rules for guarantee requirements. Reservations must be cancelled by 4PM local time to avoid penalty. Some rate plans may have additional restrictions. For early departure a fee is 50 dollars will be incurred. Casual dining. Daily full American breakfast and lunch buffets are featured in addition to the ala carte menu. Monday-Friday we offer lunch buffet that includes soup salad 2 hot entrees sides dessert. Skylights and fountains create a memorable atmosphere. Full dinner menu . Tuesday night Prime rib buffet. Dressed stone walls a fireplace and juke box make this lounge an exciting choice for afternoon or evening cocktails specialty beers or wines. Complimentary hors d*oeuvres are served Monday through Friday from 4-7pm.